WHAT DOES IT MEAN TO SIGN-UP AS AN ORGAN, EYE AND TISSUE DONOR? Signing up as an organ, eye and tissue donor means you have made the decision to donate your organs, eyes and tissues at the time of your death. Your decision to be a donor takes priority over your family’s preferences, so be sure and discuss your decision with loved ones. The heart, liver, kidneys, lungs, small intestine and pancreas are organs that can be donated. Transplantable tissue includes: bone to prevent amputation; heart valves to replace defective or diseased valves; veins to repair damaged vessels and repair blood flow; skin to act as a temporary covering for burn victims or those with severe wounds; corneas to restore sight; and ligaments and tendons to repair injured joints. Just one donor can save up to eight lives through organ donation and save or heal more than 75 lives through eye and tissue donation! No, an open casket funeral is possible as donation does not limit funeral or burial arrangements. 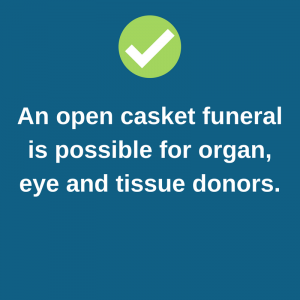 The body is treated with great respect and dignity throughout the donation process, and the donor’s appearance following donation still allows for an open-casket funeral. Once the organ and/or tissue recovery process is completed, the body is released to the donor’s family. The time required for the donation process varies depending on the organs and tissues recovered, and is generally completed within 24 to 48 hours. The recovery organization communicates with the family and/or funeral home during this time frame. No, your donation is a gift. There is no cost to the donor’s family or estate for organ and tissue donation. Recovery organizations assume all costs associated with recovering and processing organs and tissues for transplant once death has been declared and authorization is confirmed through the donor registry, or from the family in lieu of registration. 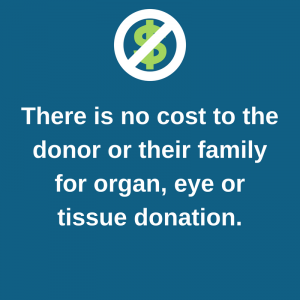 These costs are never passed on to the donor family. Once a transplant occurs, these costs are reimbursed by transplant centers, and the transplant center, in turn, will bill the recipient’s insurance plan. Expenses incurred before the donation of organs or tissue in attempt to save the donor’s life, and funeral expenses remain the responsibility of the donor’s family. No. Living donation is another incredible way you can help save the life of someone waiting for an organ transplant. 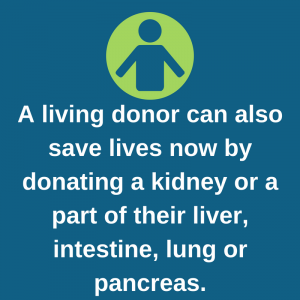 Through living donation, a living person can donate a kidney or part of the liver, lung, intestine or pancreas to another person in need of a transplant. Living donation is not part of signing up to be an organ, eye and tissue donor and should be discussed directly with a transplant center. For more information, see the more resources page for a list of local transplant centers. 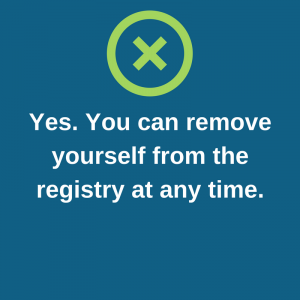 CAN I REMOVE MY NAME FROM THE DONOR REGISTRY? Yes. To remove your name from the registry, you can complete the online form or send a request to remove your name in writing to the Colorado or Wyoming Donor Registry at 720 S. Colorado Blvd, Suite 800-N, Denver, CO 80246. Be sure to include your full name, date of birth, mailing address, driver’s license number, email address and signature. Once your communication is received, you will receive a confirmation message via email or postal mail. What steps must I take to become an organ and tissue donor? Simply register your decision to be an organ, eye and tissue donor on your state’s donor registry by saying Yes at the Driver Services or signing up online. No further legal documentation is necessary. Most importantly, be sure to discuss your decision with your family. Is saying Yes at Driver Services enough? Yes. Once you’ve said Yes at the Driver Services, there is no need to sign up through any other mechanism, unless you change your decision. If you’ve signed up through another mechanism and you are asked about registry status at the Driver Services, it’s important to say Yes, as your most recent decision will be followed. By signing up on the registry, your decision to donate is stored in a secure, confidential database. Should your death result in the opportunity for you to be a donor, an official record of your donor designation will be readily available and your decision to donate will be respected. If I have an advance directive, should I also sign-up, or will my advance directive be enough? You should sign-up. Due to the rapid and emotional nature of events surrounding sudden death, families often do not have time to check legal documents prior to being approached about donation. 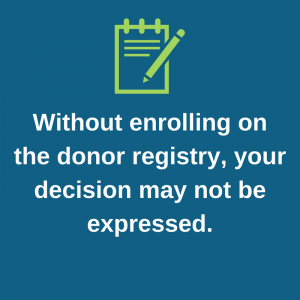 Without enrolling on the registry, your decision may not be expressed. However, since the registry is viewed in all potential donation cases, we are able to share proof of registration with family members at the time donation is discussed, ensuring your family is informed and your decision is carried out. Is there an age limit to sign up on the Donate Life Wyoming Organ, Eye and Tissue Donor Registry? 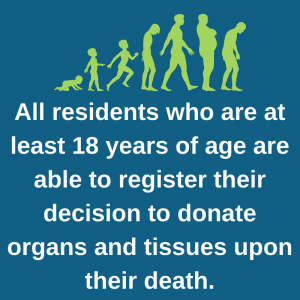 All residents who are at least 18 years of age are able to register their authorization to donate specific or all organs and tissues upon their death. Children between the ages of 13 and 17 can join the registry; however, until the designated donor is 18 years old, their parents (or legal guardian) will make the final decision about organ and tissue donation. Can I register my children? 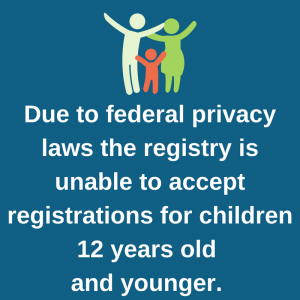 Due to federal privacy laws prohibiting the collection of personal information for individuals under age 13, the registry is unable to accept registrations for children 12 years old and younger. Until registrants and non-registrants alike are 18 years old, their parents (or legal guardian) will make the final decision about organ and tissue donation. 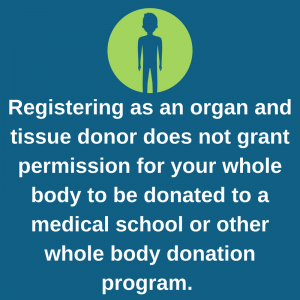 Does my registration grant authorization for whole body donation? 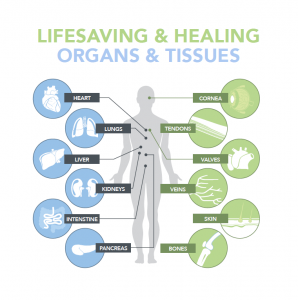 The process of donating your whole body to science for research or medical education is a completely separate process outside of the Wyoming Donor Registry. In many cases, both can occur. Even if you have chosen to donate your whole body to science or medical education, you should still register here for the possibility of having organs and tissues be used for transplantation when possible. 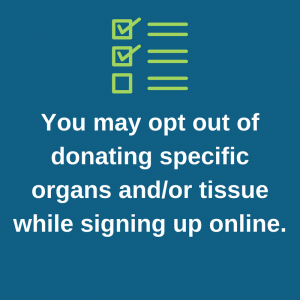 You may opt out of donating specific organs and/or tissue while signing up online. Simply state your specification under the“Additional Information” section located near the end of the online registration form. To avoid any ambiguity, make your comments brief and clear. Is it possible to restrict my donation from any specific group? 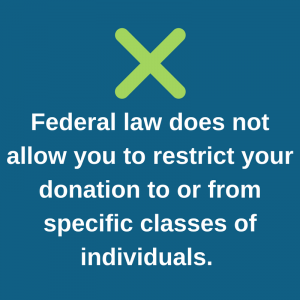 Federal law does not allow you to restrict your donation to or from specific classes of individuals. Donation is an altruistic gift that is allocated to those most in need. Can I direct my organ donation to a specific individual? 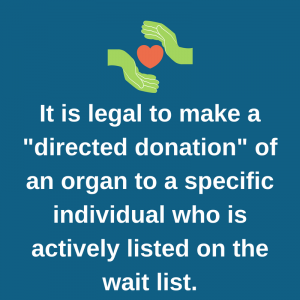 It is legal to make a “directed donation” of an organ to a specific individual who is actively listed on the National Organ Transplant Wait List (organs may not be directed to a specified group). Directed donation is addressed with the legal next of kin at the time of donation so be sure and discuss with your loved ones. 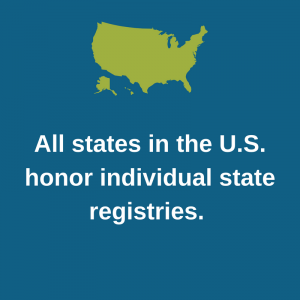 All states in the U.S. honor individual state registries. If you signed up as a donor via the state donor registry through the Driver Services, there is no need to register elsewhere as registry status is checked through your state of residence. All matters concerning organ and tissue donation are under the jurisdiction of each state’s respective laws. Joining the Donate Life America Centralized Registry is a positive step to reaffirm your decision. 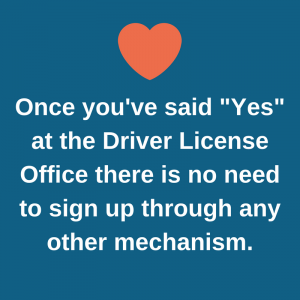 Just be sure and say Yes each time you renew your driver license or state ID as your most recent decision is valid. For information on how to become a donor in other states, visit DonateLife.net. If someone has specified in his or her will how long they want to remain on ventilated-support, will this affect the donation process? Organ donation is possible when a person has signed a do not resuscitate order (DNR). 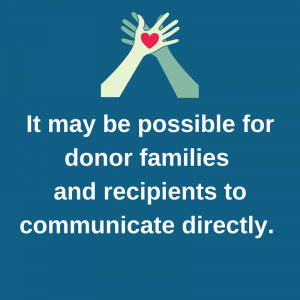 Staff of the local organ procurement organization that facilitates the donation process, for example Donor Alliance in Wyoming, will communicate with the family to ensure their loved one’s end-of-life preferences are followed and they are able to give the gift of life. In the case of registered brain-dead donors, federal law requires that a patient’s designation as a donor supersede DNR status. Processes necessary to evaluate and manage the lifesaving gift of donation therefore take priority over a DNR. I think I may need an organ transplant. How do I get added to the list? 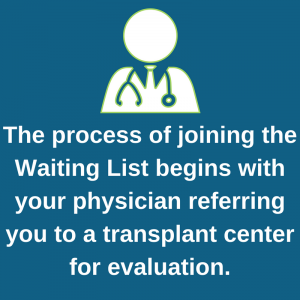 The process of joining the UNOS National Organ Transplant Waiting List begins with your physician referring you to a transplant center for evaluation. A multidisciplinary team of doctors, transplant surgeons, and medical professionals makes the decision as to whether a patient is a suitable candidate, and whether or not to list the patient for an organ transplant. This decision is based on the status of the patient’s health, his or her medical and social history, and the expectation of improvement after the transplant takes place. 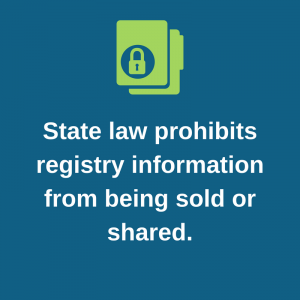 State law prohibits registry information from being sold or shared with any company or government agency. 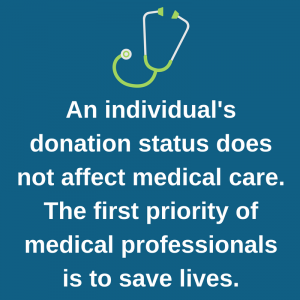 Registry status is only accessed at the time of death and by those agencies who are directly involved in the organ, eye and tissue donation process. The information of all residents, including undocumented residents who decide to register as organ, eye and tissue donors will be kept confidential. 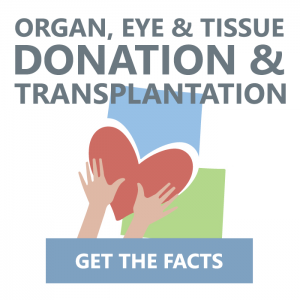 For further questions regarding organ, eye and tissue donation, please contact the federally-designated, non-profit organ procurement organization covering Wyoming, Donor Alliance at 303-329-4747 or DonorRegistry@DonorAlliance.org.